Produced by ATFilms, this ultra-high reflectivity mirror is ideal for cavity ring-down (CRD) spectroscopy and other applications requiring very low loss or absorption reflectivity. Single-band Bandpass Filters, Multiband Bandpass Filters, Edge Filters, Single-edge Dichroic Beamsplitters, Multiedge Dichroic Baeamsplitters. EdgeBasic filters are value-priced, hard-coated edge filters for Raman spectroscopy and for fluorescence microscopy and measurements. designed to efficiently multiplex or demultiplex (combine or separate) laser beams at a 45° angle of incidence. Keep the desirable laser light while eliminating the noise. All Semrock filters demonstrate exceptional reliability. The simple all-glass structure combined with ion-beam-sputtered hard coatings are virtually impervious to humidity and temperature induced degradation. 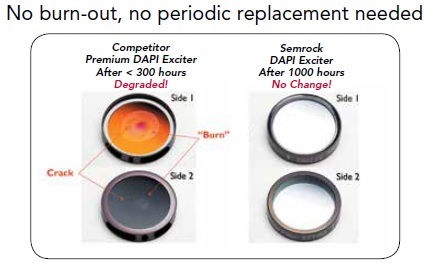 Plus, Semrock filters don’t “burn out” and they can be readily cleaned and handled. Semrock confidently backs our filters with a comprehensive ten year warranty. Built to preserve their high level of performance in test after test, year after year, our filters reduce your cost of ownership by eliminating the expense and uncertainty of replacement costs. Batch-to-batch reproducibility. Whether you are using a filter manufactured last year or last week, the results will always be the same. Our highly automated volume manufacturing systems closely monitor every step of our processes to ensure quality and performance of each and every filter. End users never need to worry whether results will vary when setting up a new system, and OEM manufacturers can rely on a secure supply line. Semrock successfully combines the most sophisticated and modern ion-beam-sputtering deposition systems, renowned for their stability, with our own proprietary deposition control technology, unique predictive algorithms, process improvements, and volume manufacturing capability. The result is optical filters of unsurpassed performance that set the standard for the Biotech and Analytical Instrumentation industries. These filters are so exceptional that they are patented and award-winning. We never stop innovating. Semrock’s no burn-out optical filters are all made with ion-beam sputtering and our exclusively single-substrate construction for the highest transmission on the market. Steeper edges, precise wavelength accuracy, and carefully optimized blocking mean better contrast and faster measurements - even at UV wavelengths. SearchLight allows you to easily select the elements of your fluorescence system and quickly calculate a relative signal brightness, autofluorescence level and signal to noise ratio. The intuitive interface makes it easy to manipulate any component and to see, for example, if a filter set is compatible with a new fluorophore or the effects of changing the excitation light source or the objective’s numerical aperture.